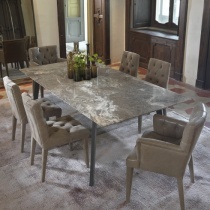 A dining table is a very important piece – it is where family and friends gather to eat, discuss, gossip, laugh, express opinions, debate current events and so much more. 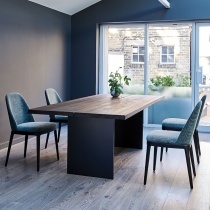 Our dining tables are designed to become part of the family, a piece that will last for years and years and hopefully be passed down to the next generation – that’s why all of our dining tables are now made only from solid wood. There is nothing more warm, forgiving and durable than a beautiful solid wood dining table. And real wood is one of those wonderful materials that actually improves with age, where little knocks, scratches, patinas and marks actually add to the character of the wood and tell a little story about who once dined there. At Amode we would call our style ‘Industrial Luxe’. What this means is that we take very linear, industrial elements and materials and mix them with modern and luxurious materials to create a unique architectural style that is stylish and luxurious. 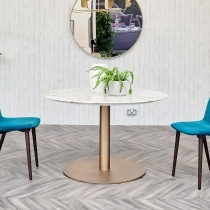 This style is clearly expressed throughout our range of dining tables, where we use materials such as solid iron or metal to create very industrial looking table legs – this is then paired with solid wood table tops for an incredibly modern, architectural feel. We also use other architectural elements such as visible bolts and metal bars, which usually will have a vintage effect. We also have a range of wood tables that are wonderfully distressed to give a very stylish rustic effect. 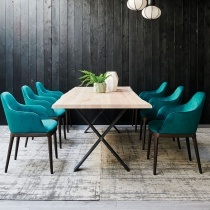 For something a little less rustic we also have a range of walnut wood dining tables that have a smooth finished table top which feature live edges that show off the natural beauty of a real wood product. 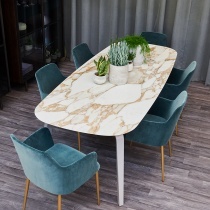 All our wood dining tables are made to order in Italy, and most can come in bespoke sizes which range from 140cm to 400cm in length, with various depth options almost available – so you are sure to find the perfect sized table for your space requirements. Due to the nature of genuine wood there will of course be natural variations in the grain pattern, knots, fills, splits etc – and these are to be celebrated as the mark for a real wood product, meaning each table will be unique. 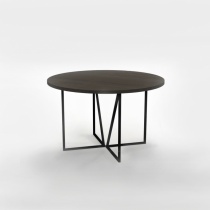 Visit our showroom where over the coming months we will be having new wood tables arriving.